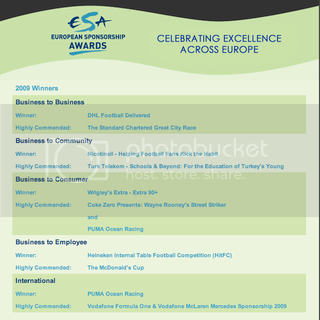 Wrigley’s Extra: Extra 90+ took home the Business to Consumer Award at the European Sponsorship Association's 2009 Awards last week. Wrigley's beat out competition from fellow shortlisted contenders, Coke Zero Presents: Wayne Rooney’s Street Striker, PUMA Ocean Racing and Vodafone Taxi Grand Prix. Wrigley's joined forces with the Sun Online to develop a "Minutes that Matter" microsite that let fans relive the Premier League's most memorable plays. For goals scored, Wrigley's Extra donated £1,000 to the Football Aid charity. Wrigley's also invited fans to "chew through" the minutes that matter with in-stadium ads shown during added time. Other award winners were, DHL Express Sweden – DHL Football Delivered (Business to Business); Heineken Internal Table Football Competition (HitFC) (Business to Employee), Nicotinell - Helping Football Fans Kick the Habit (Business to Community) and PUMA Ocean Racing (International). In addition ‘Highly Commended’ awards were presented to campaigns in each category. Taking home the 'Highly Commended' accolades were: The Standard Chartered Great City Race (Business to Business); Turk Telekom - Schools & Beyond: For the Education of Turkey's Young (Business to Community); Coke Zero Presents: Wayne Rooney's Street Striker (Business to Consumer); PUMA Ocean Racing (Business to Consumer); The McDonald's Cup (Business to Employee) and Vodafone Formula One & Vodafone McLaren Mercedes Sponsorship 2009 (International).